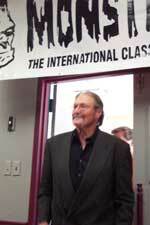 Photos provided by Barb Heiss, Robert Taylor, Jim Kessler. The classic poster come to life with FRANKENSTEIN MEETS THE WOLF MAN! 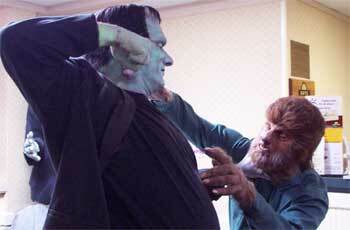 Todd Speidel as the monster and Mark Statler as the Wolf Man. Make-up by Ron Chamberlain. 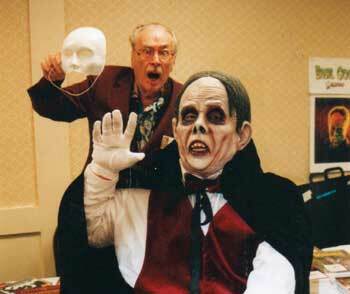 Forrest J Ackerman unmasks the Phantom (Jeff Kessler). 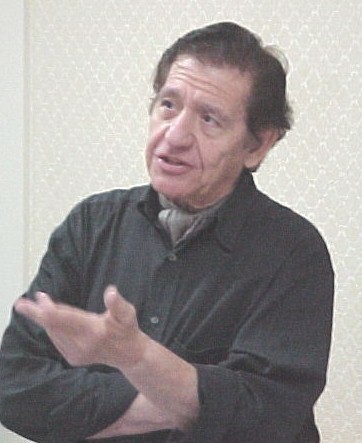 Basil Gogos talks about painting classic monsters. 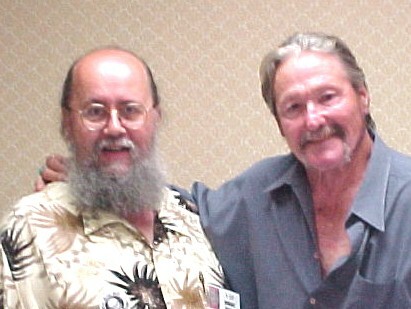 Bash attendee Robert Taylor with actor William Smith! Tom Adams and sister Shirley Tinkey working the Creepy Classics room. 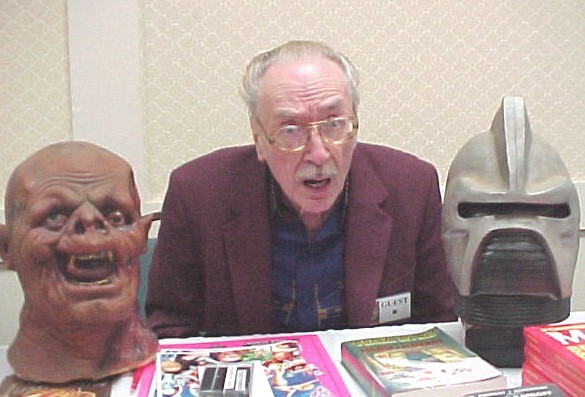 Forrest J Ackerman mugs with movie props! 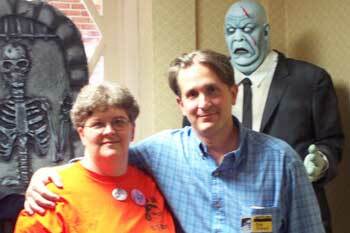 Bash staffer Barb Heiss and Robert Tinnell (Director of FRANKENSTEIN AND ME). 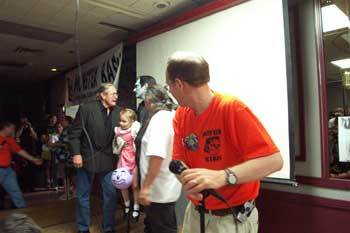 William Smith reunited with the Frankenstein Monster and a seven year old playmate (just like in GHOST OF FRANKENSTEIN)! William Smith stunned by the huge auduence on Saturday evening. 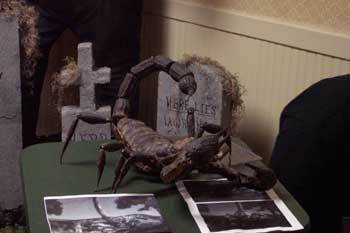 The Black Scorpion prop from the film at Monster Bash, thanks to Dennis of the Monster Movie Museum. Those Wild and Crazy Guys....actually two of the nicest people on the planet. 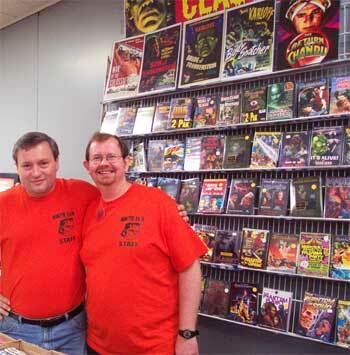 Monster Bash staffers Bob Pellegrino and Jeff Barnes in the Creepy Classics room! Bash staffer Brian Keegan greeting people at registration. 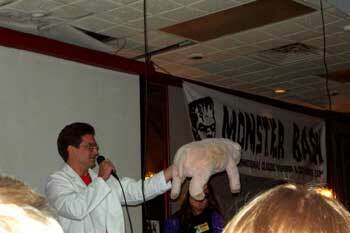 Super fan Brian Nichols introducing the crowd to FRANKENSWEIN, the star of his hysterical home movie! 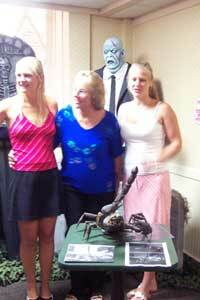 Brian talented daughters (The Ghoul Girls) greeted fans outside the movie room. The Black Scorpion has spent years trying to find the Dennings! Pictured are Summer, Dee and Serena. Richard Dennings granddaughters and daughter (center). 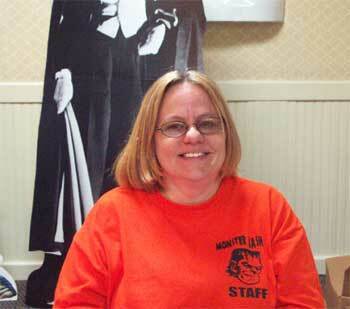 Bash staff greeter Cathy Vickers at registration. 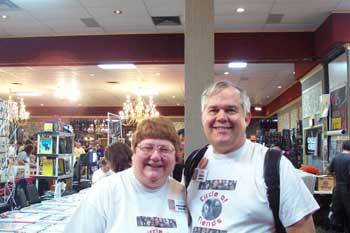 Bash attendees Charles and Ann-Marie Hensen. 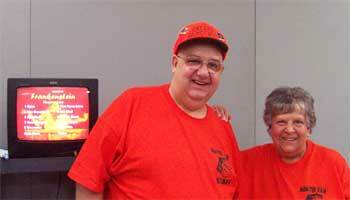 Pittsburgh TV Legend, horror host Chilly Billy Cardille and Barb Heiss! 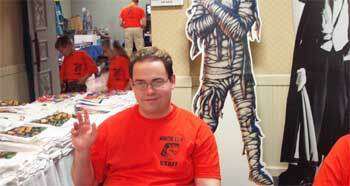 One of 5 giant sheet cakes served free at Monster Bash Saturday night. 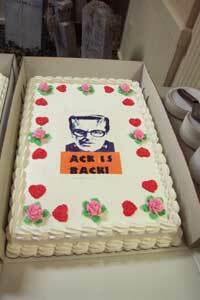 This one says "ACK IS BACK!" Forry Ackerman, of course.